On August 3, 1944, a C-47 transport carrying twenty-eight men of the U.S. Army Air Forces crashed in a ravine six miles southwest of Naper during a severe storm. There were no survivors. 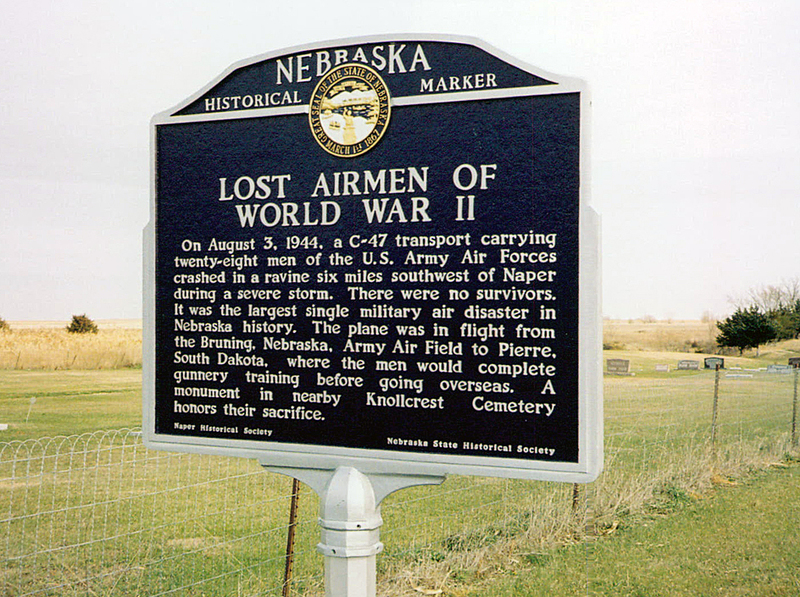 It was the largest single military air disaster in Nebraska history. The plane was in flight from the Bruning, Nebraska, Army Air Field to Pierre, South Dakota, where the men would complete gunnery training before going overseas. A monument in nearby Knollcrest Cemetery honors their sacrifice. “Lost Airmen of WW II,” Explore Nebraska History, accessed April 19, 2019, https://mynehistory.com/items/show/22.